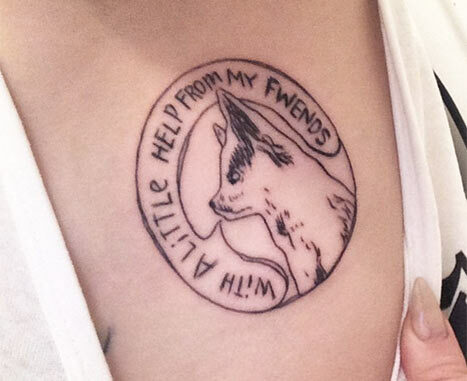 Miley Cyrus is honoring her dearly departed pet with new ink. The “We Can’t Stop” singer and some of her friends got matching tattoos of her late dog Floyd during a house party on Saturday, July 5. Cyrus was left heartbroken after her adorable Alaskan Klee Kai pooch passed away in April, reportedly from a coyote attack. One month later, she mourned the loss in an emotional note posted to her Twitter account. “I keep asking why would the world take my sweet boy from me? I’m just a baby myself…I depend on my mother still. Cyrus’ mom Tish tried to fill the void with another dog named Moonie at the time, but the singer eventually decided to give him away. Last week, she adopted a new Collie dog named Emu. I enjoy looking through a post thqt will make men and women think.